Please sign up below, by entering your email, to be notified as soon as this title becomes available to pre-order. Super Punch Fighter is a game of arena battle and video-game powers for 1-6 players. Choose a fighter, grab their deck, and start knocking your opponents off the stage. Each knockout earns you a star, and grabbing an achievement card earns you extra stars. The first player to reach nine stars wins! In more detail, each turn players can use any of the button cards in front of them to gain extra movement, draw more cards, perform extra attacks, and block damage from opponents. Every time you press a button, you put a thumb token on that button card to show it's been used. You can press as many buttons as you like, but you can remove tokens from at most four cards at the end of your turn. Every other card with a thumb token still on it is then discarded, so pick your buttons wisely! Aside from mashing buttons, you can play cards from your hand by paying the button cost of the card. Fighter cards are powerful and unique to your fighter. You can play multiple fighter cards on your turn as long as you have the buttons to pay for them, and if the last button on a fighter card matches the first button on the next card you play, you need to put a thumb token on that button only once! Pick the best cards to string together for a super-powered hit! 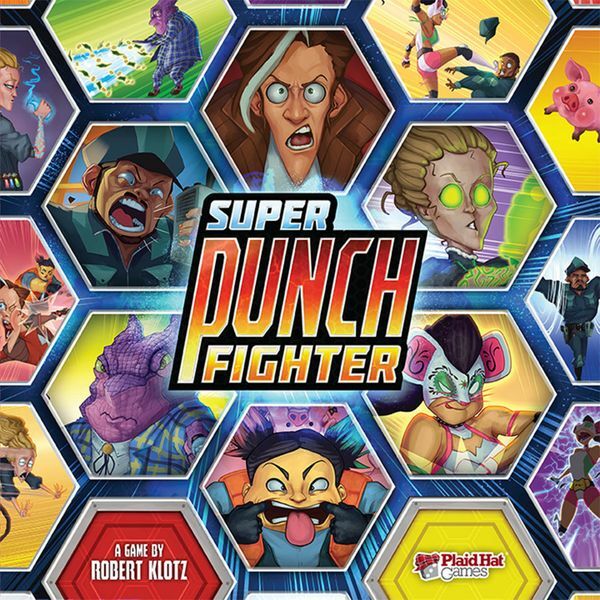 Super Punch Fighter includes a 1-2 co-operative mode called "Minion Rush" in which waves of minions try to overwhelm the board. Total your stars at the end to determine your rank, from lowly amateur to grand champion.